These exterior two panel double doors are oversized and provide an impressive contrast to the gray marble block building. 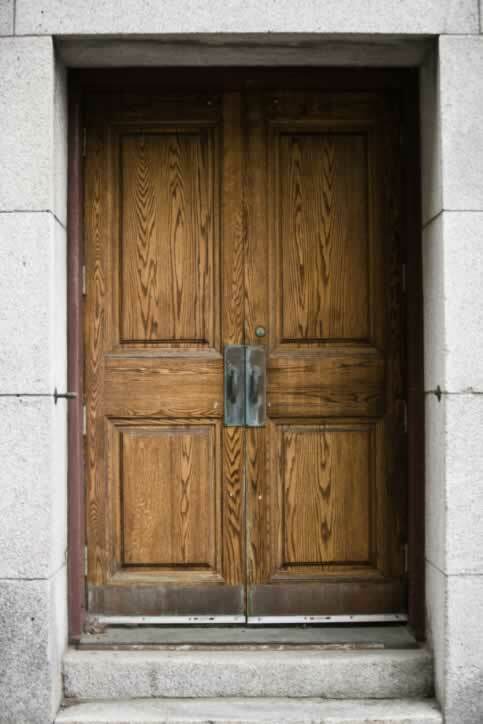 Made of walnut, the finish on these doors shows off the beautiful grain and cross grain of the wood. Due to their size, each door is hung with four hinges. The hinge pins are exposed, which can be a security risk, though the heft of these doors would likely discourage someone from removing the pins to gain unlawful entry. The double door handles are copper, aged to a patina, and a single lock secures the massive doors. Matching copper kick plates protect the bottoms of these doors from damage caused by careless feet and wayward carts and furniture. Door sweeps have been affixed over the kick plates so that dirt and debris on the concrete stairs is brushed away each time the doors open.